Motorway 16 north of Copenhagen. 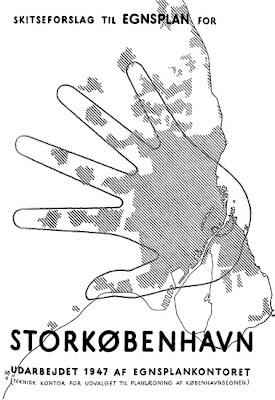 In Denmark, during autumn 2011, right-wing politicians and the media attacked the center-left government proposal for a congestion ring around Copenhagen. Their attack, which wasn't much more than a bunch of media hysteria was, surprisingly, successful. 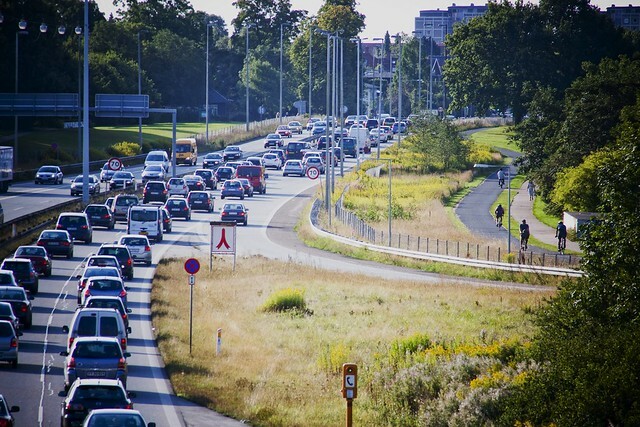 In early 2012, the Social Democrats lost the courage to push forward with the congestion ring plan because of the massive media coverage of the opposition from the right-wing parties, the car owners' association and the Danish Industry association. Despite the fact that they went to the election with the congestion ring as a primary point. Most humililating for them was the opposition from a number of Social Democratic mayors from the municipalities around Copenhagen. The only neutral opinon poll actually showed a small majority of voters favoured the congestion ring. As a compromise, the Government decided to form a commission to address the Copenhagen congestion and pollution challenges. Trængselskommissionen - or The Congestion Commission. 1 Analyse basic challenges of the capital-area traffic system. 2 Analyse advantages and disadvantages of a range of initiatives. 3 Suggest a strategy and financing. Whereas the goal of the Congestion ring was to reduce car traffic by some 30%, the commission started out with lowering the bar to less than zero. Now the vague objective is to lower the growth of car traffic. They are not considering whether or not growth of traffic may not be a benefit to society. Rethinking how we develop our cities is also out of the question. Nor are concepts like reducing urban sprawl, giving people incentives to move closer to work, reducing car-centric shopping malls in favour of more closely-knit city environments with local shops. Not at all. Prior to the first meeting, a range of literature and analyses were listed for consideration. None of them included cycling or other modes of active transportation. In addition, all the presentations after the first meeting have all completely ignored cycling. "I extremely pleased that we will now have a broad commission that will contribute with solutions for how we can reduce congestion and pollution in the Copenhagen region. The Commission's proposals will be important input in the negotiations for financing investments in public transport in the coming years". Hmm. Here's what the Commission is doing. The Commssion has formed 7 focus groups, but not one is aimed at promoting cycling as transport or any form of active transportation. They seem to have forgotten that the bicycle is the primary transport mode for citizens and, among all commuters, it is second to the car. Had the congestion ring been implemented, all research suggests that cycling would have become the primary choice of the majority of commuters in and out of Copenhagen. The research also shows that even if public transport was free, only 5% of motorists would leave the car at home. Of the seven focus groups, two are about cars and one is about a national road-pricing system - even though the Commission is only supposed to address issues affecting the Copenhagen region. Neither mention bicycles. Another project is about financing congestion reducation. Again. No mention of bicycles. Two focus groups are about public transportation and here there is passing mentions of bicycles regarding connectivity to stations and busstops. One group is about low emissions transport and bicycles are mentioned as one of many solutions, including electric cars, trains, busses, metro, tramways, etc. Walking and running are completely ignored. The last is about general road usage and effectiveness and, rather than being focused on modes of transport - like which mode has a better capacity utilization of road lanes than cars - it's focused on improving light-cycles in intersections and other “intelligent” traffic systems (ITS). There are brief mentions of cycling. It's mind-boggling to see this group struggle with light-cycles and traffic flow after 85 years of traffic engineers failing to do anything about it. The outcome of this Congestion Commission will certainly not be a modern capital city and society based on an innovative rethinking of transportation, with an emphasis is on active transportation. Their approach is very last century and old-fashioned. Incentives for electric cars and major investments in car infrastructure and public transportation are the primary focus. Car traffic will, sadly, continue to grow. Even our supposed friends among the NGOs in the Commission don´t really have a great appreciation for cycling as transport. I got a mail the other day from one of the members of the commission. He wanted to reassure me that bicycles would be remembered in the solution. However, he noted, the real problem with traffic is the out-of-town commuters, and the distance is too great for cycling. Therefore, public transit is the primary solution. I am certain that he could not be more wrong. First of all, we know that motorists are notoriously difficult to recruit to public transit. At least cycling is still individual transportation and independent mobility. Distance is many things, and not a static. From 2003 to 2009 the average distance between home and work rose more than 10%, thanks to large tax-deductions for commuting more than 22 km daily. The deduction increases the attractiveness of moving away from the cities to areas with cheaper housing. Affordable housing in the city would on the other hand attract people to move closer to work, which is the most cited reason to move away from Copenhagen. And less traffic & traffic noise is a top 3 complaint among both residents and former residents. Which explains how congestion is an evil cycle, chasing ever more people out of the city, only to see them return every morning in their polluting noisy car. Distance is also not a static of length. If you are on a bicycle, distance is a combination of the effort needed and of time. A high-class route that is pleasant, mostly flat, without intersection that prioritize cars and smooth asphalt will feel shorter than a shorter route with plenty of intersections, potholes and close to the pollution and noise of roads. The current Cykelsuperstier - "Bicycle Superhighways" - are not that super, really. They are made of a patchwork of existing bike lanes and most have not been improved to a reasonable level. Instead, a new, visionary network should be the first thing on the agenda. It should be laid out to follow the regional train network (S-tog) and the coastal train line. That would give six radials from the City to the most populated areas in the region. Reaching out 25 - 40 km from the city centre. The lanes should follow the track above and below cross roads and have on- and off-ramps, as if it was an expressway for cars. At roughly 5, 10 and 20 km from the City Centre, the six radial lines should be interconnected by ring routes of a superior quality. And wouldn't it be cool if the routes included soft running tracks, as well? That’s the right solution to maximize bicyle transportation. It may be much more expensive than what politicians are used to investing in cycling in Denmark, but much less than investing in car infrastructure like expressways, tunnels, bridges and parking. The future maintencance costs are even lower and, as we all know by now, the health benefits are much, much, much higher. It's embarassing that Danish politicians seem to have forgotten this and refuse to embrace the mentality of the new century and work towards a paradigm shift.